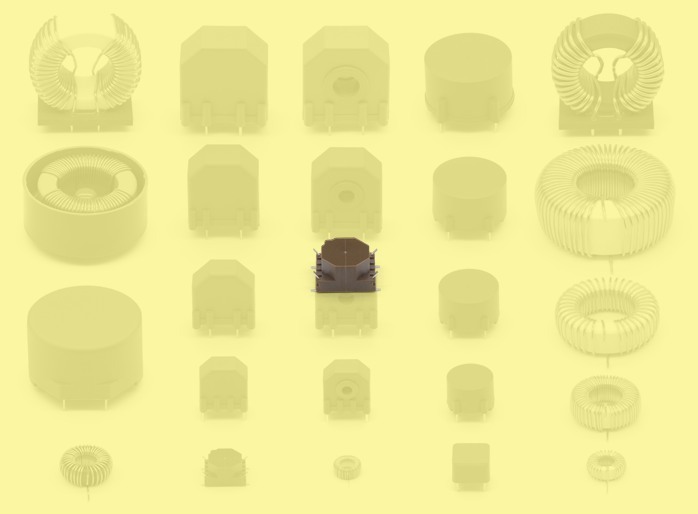 These SMD chokes are usually based on alloy powder cores with Sendust material. They have only slightly larger inductance dependence on DC magnetization when compared to the iron powder cores. However their main advantages are much better frequency properties, which predestined them to use as the switch-source chokes to frequency at least 100 kHz. Standard chokes of series PMEC 300 are designed as the storage chokes for high-efficiency SMPS. Chokes are fitted with two windings, which are usually connected on PCB in parallel. However the option of serial connection brings the advantage of choosing the resulting inductance in uncommon fine steps. 1) Measured at 10 kHz, 50 mV and 25 °C.